Nic Maddinson is struggling as skipper with regular captain Glenn Maxwell out playing for the national side. 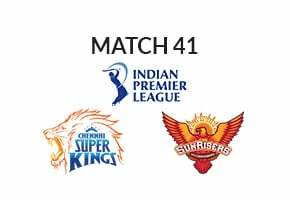 The side which looked like having found its form after initial hiccups goes into this game with two consecutive defeats at the hands of Perth Scorchers. They are half as strong a side without Maxwell, Marcus Stoinis and Peter Handscomb who are with the national side at the moment. Maddinson would know the importance of the next game for the team’s progress into the play-offs and would want his men to give out their best performance against Hobart Hurricanes who have looked the best side so far this season. Evan Gulbis and Ben Dunk gave good start to the team but somewhere they are feeling the absence of Stoinis. The middle order doesn’t appear threatening with Nick Larkin and Maddison struggling to push up the scoring. Seb Gotch along with the experienced Dwayne Bravo must steer the game in the middle overs for the side to perform well in the next game. The bowling attack also suffers in the absence of Adam Zampa. But Liam Plunkett has bowled well and he would need support from the likes of Jackson Bird and Bravo in the next game. Bravo’s form with the ball this season hasn’t been up to the mark creating trouble for the side. Hobart Hurricanes had done everything right till their last game against Melbourne Renegades which they surprisingly lost. Mathew Wade’s team had been in great form winning their first five games riding on the performance of their top order which had delivered on every occasion. Their top order failed in the last game which led to a shock defeat at the hands of the Renegades. With a week to recoup the team would be looking to win the next encounter against the Melbourne Stars. They are sitting at the top of the points table and one more win will comfort their standing. While D’Arcy Short and Mathew Wade missed out in the last game they have been in sublime for earlier in the season and would look to do well in the next game as well. Alex Doolan missed out as well but he is a handy No. 3. Ben McDermott and George Bailey showed their abilities in the last game and the side has the punch its batting going into the next game. The bowlers have done well in the previous games with Jofra Archer and James Faulkner looking in good rhythm. Johan Botha and Clive Rose are also bowling well and the skipper would want them to maintain the momentum. Melbourne Stars aren’t in the best of form over the last couple of game having lost their key players at the most crucial juncture. By logical predictions their opponents Hobart Hurricanes would seem to be miles ahead of them at the moment. But they would have crowd support behind them their home turf Melbourne Cricket Ground. It would be interesting to see if the Stars are able to come out of their losing streak and win it against the Hurricanes who have been in brilliant form this season. 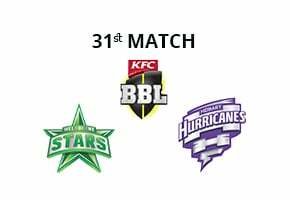 As the form stands for the two sides Hobart Hurricanes seem to be miles ahead and shall start ahead of Melbourne Stars in the next game.